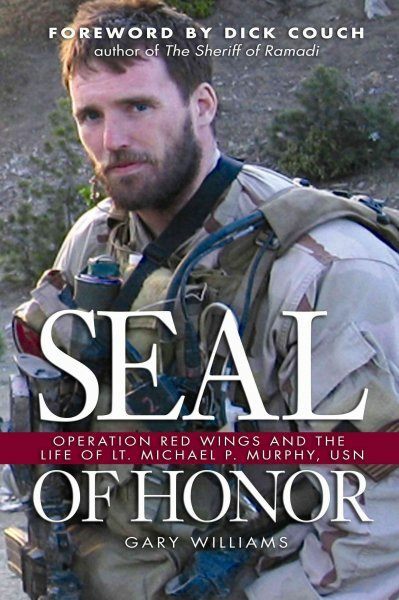 Gary Williams, Seal of Honor: Operation Red Wings and the Life of LT. Michael P. Murphy, USN. Annapolis, MD. : United States Naval Institute Press, 2010. Photographs, appendix, index. Pp. 216. ISBN: 1591149576. $29.95. Michael P. Murphy was a young man from Patchogue, Long Island, who heroically served his country and was tragically killed in the line of duty. He was posthumously awarded the Congressional Medal of Honor, America’s highest combat award, by President George W. Bush on October 22, 2007. Murphy’s story can be found in a new book by Gary Williams, Seal of Honor, which chronicles his exploits and his SEAL team’s actions fighting Al-Qaeda in Afghanistan. Williams immediately grabs the reader’s interest with his research into the circumstances of how Murphy’s family and friends slowly discovered his fate. The first two chapters, “Knock on the Door” and “Vigil for the Valiant,” evoke the excruciating feelings of Murphy’s family not knowing his survival status. It was shortly after Murphy’s initial SEAL team’s excursion into the mountains of Afghanistan, that the family had to endure the first of many difficult days of hearing reports that were tied to their son’s mission. Murphy’s parents knew him well enough to speculate on the scenarios of what had happened to their son: “Dan and Maureen realized that Michael’s character and integrity would not allow him to be the sole survivor. They knew that he would sacrifice himself to allow someone else to be the sole survivor, but it simply was not in Michael to be the only one out.” The family’s worst fears were realized when they were informed by the Navy on Monday, July 4, 2005, that their son had been killed in action. As one of fourteen Congressional Medal of Honor winners in Long Island history, Murphy’s story was deeply felt by the region as residents displayed an outpouring of grief for his actions in battle. While our area is nationally famous for its traffic congestion, this would not be a problem for the Murphy family as they traveled from Dover Air Force Base in Delaware for the wake services of their son held in Kings Park. The author’s description of the solemnity of this moment is extraordinarily poignant, including a passage about the closing down of a section of the Belt Parkway, and the Nassau and Suffolk County police cruisers that escorted Murphy and his family to the wake. After thousands of mourners paid their respects, Murphy was buried at Calverton National Cemetery. Sixteen ladder trucks from various Long Island fire departments lined both sides of the road, their ladders fully extended with a thirty-by-fifty foot American flag hanging from the center of each. The author does a wonderful job of writing about the Murphy family and how they were all integral to the development of their oldest son. Murphy’s formative experiences included time as a talented student and football player at Patchogue-Medford High School. He became so known for helping others who were targets of scorn that he earned the nickname “Protector.” Murphy went to college at Penn State where he was on the dean’s list and was a captain of his intramural teams. During his last year in college, Murphy postponed going to law school to enlist in the Navy. Called to serve, Murphy passed up the opportunity to attend one of the several prominent law schools that accepted him. Williams dissects the training of Murphy and records how he was positively perceived by his instructors and senior officers. He takes the reader into every difficult aspect of the SEAL training. During the third phase of training, Murphy watched as the events of September 11, 2001, unfolded. A moment that burned itself into the young man’s brain was when an instructor stated, “Gentlemen, this changes everything. We’re going to war!” Ensign Michael Murphy was not “going to war” – he was already there. Shortly after leaving the goat herders behind, Murphy and his men were in a new position and they were attacked by the enemy with excessive force. All four men fought off eighty to one-hundred enemy fighters that were closing in on their positions. With the enemy approaching their own lines and all of the SEAL members wounded from the fighting, Murphy knew they needed to be reinforced if they were going to survive. Williams painstakingly shows how Murphy tried to save his men, deliberately putting himself into harm’s way with no cover and getting wounded in the process to call in air support. Due to his radio transmission an imminent rescue was under way, but Murphy and two of his men were soon killed from overwhelming enemy forces. Only Marcus Luttrell would live and evade capture. He later recounted the heroics that Murphy displayed under fire in his book Lone Survivor (2007, Little, Brown & Company). This would be one of the bloodiest days in Special Forces history with the helicopter rescue team getting shot down as they descended near Murphy’s site. Operation Red Wing would be a fateful mission that saw 19 servicemen killed to fight the enemy and support friendly forces. Throughout the entire book, Williams sustains an unselfish tone and drives home a single, powerful point: Murphy was always the penultimate team player, from his youthful days to his final moments in Afghanistan. This is a triumphant look at a young man that could have been from any town on Long Island.